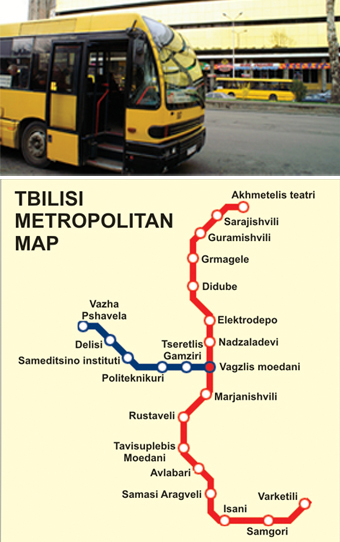 Tbilisi public transport includes: underground (metro), buses, mini-buses and taxi. The buses run around the entire city and cost 40 Tetri. You can buy a ticket at the ticket machine in the bus. The ticket machine doesn't give change so the fare should be paid exactly. Buses run at fixed times from 7am till 12pm. Early in the morning and in the evening they run infrequently. They only stop at specified bus stops. If you'd like to travel by minibuses you can catch it basically at any spot you wish (except: Chavchavadze Ave., Melikishvili St., Rustaveli Ave. and Freedom Sq.) as the minibuses have no fixed stops. The same principle works during the journey. The passenger may ask the driver to drop him/her off at any place he/she desires. Mini-buses usually cost 50 Tetri. They run from 7am to 12pm. Note: Georgia uses the right-side movement. Tbilisi Underground, called the Metro for "Metropolitan". Tbilisi metro has two lines and 21 stations. It operates from 6:00 to 24:00. The cost is set at 40 Tetri. Metro tokens can only be purchased in metro cashiers'. One can change the line at Vagzlis moedani station. Metro stations are identified by the red (M) sign.